Line up for this all-new maxiseries set on Earth X, where the Nazis won World War II! Twenty years after invading and occupying America, Germany wiped out all metahuman resistance, including the original Freedom Fighters. 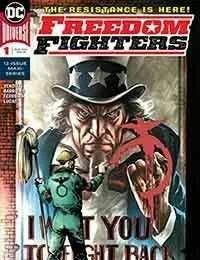 Fast-forward to the present day, and a new team of Freedom Fighters emerges to challenge the Nazi occupation once again. But if they're to have any chance of victory, they're going to need Uncle Sam—who disappeared after his original team was killed. The 12-part epic “Death of a Nation” storyline kicks off here!